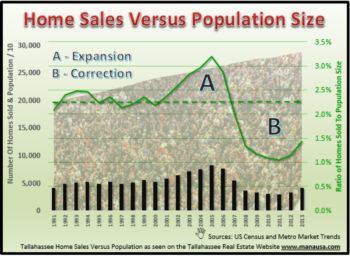 I was recently asked about whether or not I expected a change in the demand side of the Tallahassee housing market, and I shared my concerns about several trends that would figure prominently. While the supply-side of the market is hampered by the rising cost of construction and the limited supply of homes for sale in our most-needed price ranges, the demand side is most impacted by two different trends. 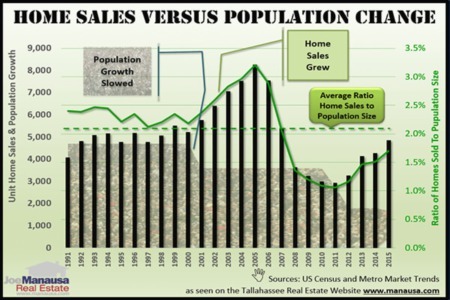 The population growth rate has been falling in Tallahassee for many years. As a key driver of demand for housing, growth in Tallahassee pretty much comes through two different sources. Babies: When we have more people born here than die here in a year, it adds to our population. While this might not be something you think about often, it has lately been the primary source of our population growth. Migration: When more people move to Tallahassee than move away from Tallahassee, this net migration adds to our population. Of course, the opposite is true as well. When we think of migration, we should think first of "jobs." Generally speaking, it's jobs that are going to bring more people to Tallahassee. Is there a correlation between politics and population growth? The following graph plots the annual population rate change and the background colors show whether a Democrat or a Republican was in office each year. I'll be the first to admit that this is not necessarily scientifically sound, but I was curious to see if there was any type of correlation between the party in the Governor's office and the population growth rate in Tallahassee. Specifically, I was wondering if one party had a greater impact on our population growth than did the other. 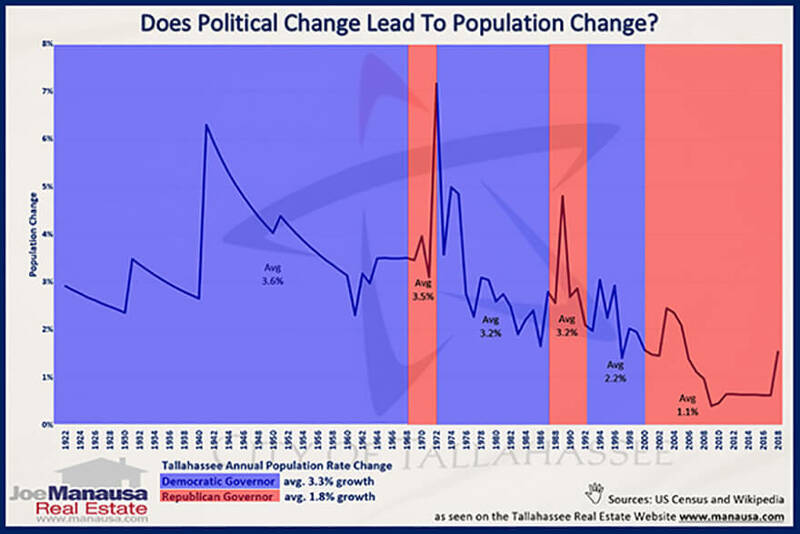 The one clear trend that I can get from the graph above is that regardless of party, the population growth rate in Tallahassee is falling. The average population growth rate in Tallahassee since 1922 has been 2.85%. During the past 97 years, our population has grown at a rate of 3.3% when Democrats have held the Governor's office, and 1.8% when Republicans have held the office. If we were to hold this a scientifically sound, we then would have to say that our population growth rate is typically 83% higher when Democrats hold office than when Republicans have the top seat. I suspect there is some correlation here, but I don't have the support of a bunch of math-types to back me up. So if you have an opinion regarding the validity of our findings, please comment below or drop me a note and let me know what you think!